Mesopotamia, 4,500-year-old Royal cemetery,18ft down,Ur(biblical Ur of Chaldees, birthplace of Abraham, son of wealthy sheikh Terah, discovered by archaeologist Sir Leonard Woolley. Bears some resemblance to the photo of the faerie Queen Titania. From the Royal tombs at Ur dating about 3,000 BC. come some very beautiful things - the famous gold dagger of Ur, a weapon whose blade is gold, its hilt of lapis lazuli decorated with gold studs, and its sheath of gold filigree work. With it was another object scarcely less remarkable, a cone shaped container of gold, ornamented with a spiral pattern and containing a set of little toilet instruments, tweezers, lancet, and pencil also of gold. The royal graves all have a harp. The most magnificent yet found has a sounding-box bordered with a broad edging of mosaic in red, white and blue. The two uprights were encrusted with white shell and lapis lazuli and red stone arranged in zones separated with wide gold bands. Shell plaques engraved with animal scenes adorned the front, and above these projected a splendid head of a bearded bull wrought in heavy gold, with a lapis lazuli beard. Queen Shubad on her deathbed wore an ornate headdress made of a long gold hair ribbon covered by beaded wreaths with gold pendants, heavy earrings of gold and a golden Spanish type comb with five points ending in lapis centred flowers of gold. By the side of the body lay a second headdress. 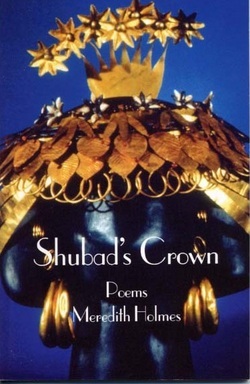 On a diadem made of soft white leather had been sewn thousands of minute lapis lazuli beads, and against this background of solid blue were set a row of exquisitely fashioned gold animals, stags, gazelles, bulls and goats, with between them clusters of pomegranates, three fruit hanging together shielded by their leaves. Puabi (Akkadian: ("Word of my father"), also called Shubad in Sumerian, was an important personage in the Sumerian city of Ur, during the First Dynasty of Ur (c.2600 BCE). Commonly labeled as a "queen", her status is somewhat in dispute. Several cylinder seals in her tomb identify her by the title "nin" or "eresh", a Sumerian word which can denote a queen or a priestess. The fact that Puabi, herself a Semitic Akkadian, was an important figure among Sumerians, indicates a high degree of cultural exchange and influence between the ancient Sumerians and their Semitic neighbors. More than 7,000 years ago, the fertile Mesopotamian plain between the Tigris and the Euphrates rivers teamed with life. The first settlements of small villages, some coalescing into towns, were built by the Ubaidians, the nomadic tribes from Al-Ubaid site. These settlements, later known as the Sumerian civilization, gradually developed into sophisticated city-states, namely Uruk, Kish, Umma, Lagash, Larsa, Nippur and Ur, the most celebrated of all. During the centuries that followed, the Akkadians, Babylonians, Assyrians, Hittites, Chaldeans, Israelites, Pheonicians, and Elamites (Persians) established their kingdoms in the region – the foundation for future civilizations, on which many cultures succeeded. Until the mid-19th century the existence of the Sumerians was merely not suspected. The first major excavations leading to the discovery of Sumer were conducted in 1842-1854 at the Assyrian library of King Ashurbanipal at Nineveh. During the late 19th century, a series of excavations was undertaken at Lagash and Nippur. In the late 1920's and early 1930's, during almost 20 years of immense excavation 18 feet below the ground level, the joint British-American team led by the archaeologist Sir Leonard Woolley – assisted by Sir Max Mallowan and his wife, the mystery novelist Agatha Christie – made sensational discoveries at the city of Ur (biblical, Ur of the Chaldees, the birthplace of Patriarch Abraham, the son of the wealthy shekh Terah). The archaeological finds included: a massive pyramidal and amazingly well-preserved temple – a ziggurat, known today as Tall al-Mukayyar, c. 2,100 B.C. ; the Royal Cemetery at Ur, filled with valuable jewelry and gold artifacts, including several musical instruments; flood strata – a deposit of silt measuring 11 feet in depth, the evidence of the Nuh's Flood from the times of Noah, c. 4,000-3,000 B.C. The 4,500-year-old cemetery at Ur was in use for almost five hundred years. The most renown of the burials, described by Woolley as "Royal Tombs", dated from the Early Dynastic-III period, c. 2,600-2,500 B.C. Among the 1,800 graves of "common folk", containing the remains of nearly 2,000 people, there were sixteen "royal tombs" with the remains of many attendants, suggesting human sacrifices, probably carried out among willing participants. Musicians, soldiers, courtiers, and servants had accompanied their kings and queens into the afterlife. Some of the most beautiful artifacts of Sumerian art were found mostly at the "royal tombs". The luxurious contents included richly adorned headdresses, ritual gold daggers, cups made of gold and silver, alabaster bowls, gold vessels, thousand of small beads of lapis lazuli, personal ornaments, gold pins and amulets, rings and necklaces, solid gold bull's heads on tops of embellished wooden harps and lyres, mosaic panels, cuneiform tablets, sledges and chariots, helmets and spears, horses and oxen, a gold statuette of a ram caught in a thicket (recalling Abraham's ram sacrifice), and offerings of food. The treasures recovered from the Royal Cemetery at Ur were subsequently divided among the University Museum of Pennsylvania in Philadelphia, the British Museum in London and the Iraqi National Museum in Baghdad. Catalogued as "private grave" PG-800, the remains of Lady Pu-abi, known also as "Queen Shub-Ad" were found. Her name was identified by the inscription on a lapis lazuli cylinder seal that laid on her shoulder. Pu-abi's "death pit" contained the remains of more than a dozen ladies-in-waiting in "full regalia". The approach to the burial chamber had been "guarded" by five men with copper daggers. The harpist "seated" at the corner still accompanied his/her "divine" queen to the next world. Close by, the remnants of two wooden frames with many separate parts were found. The modern reproduction became a challenge for Woolley. He reconstructed the object, but was never happy with the result. Actually, this particular restoration suffered from the problem that the frames, appeared to be that of a harp and a lyre, long buried together, were restored as one musical instrument. Later on, a separation was achieved in form of two instruments: the harp, decorated with a bull's head, and with a pattern of gold on the sound-box, and the lyre with rectangular sound-box, and with the golden bull's head on its top. In the late 1960s, a new silvery lyre was reconstructed from the many pieces still left. The wooden parts and the strings on the instruments are modern, but the lapis lazuli, shell and limestone mosaic, set in bitumen are ancient. The gold bull's head (but not the horns) on one of the lyres are ancient, and the restored horns on the other lyre have been made of ivory. All three instruments are eleven-stringed ones, but the shape of the sound-boxes, along with the length of the strings distinct them. The strings of the harp, fastened on the wooden beam, pointed upward with gold rings (or tuning pegs) are of diminishing lengths, while the strings of the lyres are relatively equal in length. These three instruments, the masterpieces of Sumerian art, dated c. 2,600-2,350 B.C., known as the Harp from Ur, the Queen's Lyre, and the Silver Lyre, are now preserved at the British Museum. Catalogued as "private grave" PG-789, in the so-called "King's Grave", close to the sanctuary of Queen Pu-abi, the remains of King "Lugal" Abargi, dated c. 2,685 B.C., were found. Even though this tomb had been robbed in antiquity, its "death pit" remained intact. The entrance was "guarded" by six soldiers wearing copper helmets and carrying spears. A dozen men armed with their weapons laid close to the bodies of richly adorned women, supposedly singers and a harpist. Close to their heads the remnants of two musical instruments were found. They may be associated with the ceremonial burial of the king. Their music and songs accompanied their beloved king to the Underworld. 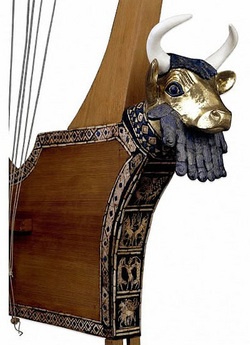 One of the most beautiful restorations of a musical instrument from Ur, is the Great Lyre, founded in the "King's Grave" with its original and well-preserved inlaid plaque, and a gold bull's head with curls of hair, beard and eyes of lapis lazuli. The lyre’s wooden structure has been reconstructed from the detailed measurement made by pouring the plaster into the impression left by the disintegrated wood. The eleven strings fastened on the rectangular sound-box are modern. The front of the sound-box is decorated with the mosaic plaque, trapezoidal in shape and set in bitumen. In one of four scenes, depicting mythological creatures, a seated animal – onager or bear – plays a similar lyre. Curiously, the strings of the lyre are being plucked with the fingers (instead of hoofs) by an animal having a human hand. The Great Lyre, dated c. 2,750 B.C., regarded as a treasure of the ancient world had been recreated by Leonard Woolley, and is now on exhibit at the University of Pennsylvania Museum in Philadelphia. University of Pennsylvania Museum, Philadelphia, PA. Catalogued as "private grave" PG-1273, and referred by Woolley as the "Great death pit", contained a large number of skeletons laid in rows, side by side, as if asleep. The musicians, fully armed soldiers, and court ladies-in-waiting, elegantly dressed in silk with gold embroidery would follow their "divine" master into his grave. In this gigantic "death pit", suggesting a mass suicide, probably caused by despair (because the king was gone, or the city was destroyed once again, or because of orgies or a ritual sacrifice or ceremonial drinking of a drug or a poisonous liquid), the mystery of the Sumerians were discovered. It seems that they believed in continuation of life after death, described by many as – "a dark abode of miserable shadows where eternity was spent in a wretched existence" – even though their "gods" offered no explanation of any such existence. As the grave was dug out, two more musical instruments were uncovered. They laid on top of each other, and had been crushed together by the weight of the earth layer. Eventually, during the process of restoration they had been separated. The rectangular sound-box with mother-of-pearl inlay was decorated with a solid gold bull's head, wearing solid gold beard (no lapis lazuli) and solid gold horns. These two instruments known as the Queen's Golden Harp and the Lyre of Queen Shub-Ad, c. 2,600 B.C. were included in the Mesopotamian Archaeological Collection of the Iraq Museum in Baghdad. Catalogued as "private grave" PG-779, the largest tomb at the cemetery contained an object, covered with inlaid little beads of lapis lazuli and small carved figures, which Woolley called "The Standard of Ur." It was found laying in the corner of a burial chamber above a head of a man. When found, the original wooden frame was decayed, and two mosaic panels, set in the bitumen, were broken. Its original function is not known. Woolley envisaged that it had been carried on a pole as a standard. Another suggestion is that the hollow box formed a part of a musical instrument. It was decorated on its four sides with inlaid mosaic scenes representing all social classes at war and peace. At the top of the "peace" panel, a singer and a harpist playing the vertical harp (also known as a lyre harp or a lyre like those found in many "royal" tombs) entertained the king. The Standard of Ur, c. 2,650-2,400 B.C., is one of the most informative Sumerian objects of art that were discovered at Ur. The present restoration is but a best guess as to how it originally appeared. It is now preserved at the British Museum in London. In April 2003, after a 48-hour long rampage and plunder at the Iraq Museum in Baghdad, many priceless artifacts of Mesopotamian culture were stolen, badly damaged or disappeared, perhaps forever. Among the lost treasures are Sumerian harps and lyres. Some elements of the musical instruments, like silver plating and inlays of gems, ivory and mother-of-pearl have been stripped off. The solid gold head of a bull was stolen. Fortunately, thanks to the museum practices and the archaeologists' foresight, hundreds of relics from the ancient Sumeria have been distributed worldwide following excavation by the British-American team. Finally, after more then forty eight centuries, the world received not only a glimpse to the past, but many exact replicas of the best golden objects, including several harps and lyres. The man to whom we owe all of this is Sir Leonard Woolley (1880-1960). Such a frame is an archetype for the more developed mediaeval and modern framed harps. Note : Some historical sources (not to mention media, newspapers and popular magazines) do not make a clear distinction between harp and lyre. The lyres founded at the Royal Cemetery at Ur have been misinterpreted as a harp. Due to common use of rectangular sound-boxes, identical Sumerian instruments, with two arms connecting a crossbar, were called harp or lyre, depending on the discoverer's preference. It resulted in having lyre – a smaller instrument – being called "harp", and lesser forms of harp being called lyres. The main element which distinguishes these two instruments (if not the shape of the sound-box or the frame) are the strings: diminishing in length in harp, and almost equal in length in the lyre. Most Sumerian lyres had eleven strings, and it is assumed that each string produced a different sound, thus suggesting that Sumerian music for the lyre was more complicated than its contemporary Egyptian music, written for four-stringed lyre. The large Sumerian lyres would have sounded somewhat like a stringed deep tone bass, and would have produced a voluminous sound, as powerful as a bull's bellowing, apparently in a human imitation of a bull's "voice". It is worthy to add, that the oldest musical instrument in Sumeria was indeed the harp, dated from Uruk period, c. 4,000-3,200 B.C. It was a small harp made of cranium and horns of a Sacred Bull, which Gilgamesh, the King of Uruk (biblical Erech; modern Warka) heroically slew at the City wall's precinct of the Isthar temple. He then "clothed" the harp with gold and horns and dedicated it in memory of his father Lugalbandu, the third king of Erech after the great flood, worshipped for over a thousand years. On July 6, 2003, a TV program on the recovered artifacts that belong to Iraq Museum in Baghdad was aired by The National Geographic. The Harp of Ur was shown being in a miserable condition, broken into three separate parts: the two vertical arms and the resonating box. The resonating box and the frame, both decorated with mother of pearl-inlaid mosaic, are badly smashed and large parts of the mosaic missing. This TV program reported the sensational discovery made on June 12, 2003, at the site of Iraq's Central Bank in Baghdad. In the destroyed bank building, in underground vaults, flooded with sewer waters and hidden behind double walls, a US recovery team and Iraqi officials unexpectedly found in wooden cases the so called Nimrud Treasure, i.e. the fabled collection of golden jewelry that was unearthed in the 1980s by an Iraqi archeological expedition in the Assyrian royal tombs in Nimrud. The Nimrud Treasure had been shown publically only once soon after it was found. Then it mysteriously disappeared in the hands of Saddam Hussein's officials. This treasure was being sought after since the fall of the Saddam's regime. And now, amongst the Nimrud Treasure, the golden bull's head that once adorned the Harp of Ur was found intact. Even more surprising was the realization that this bull's head remained hidden in the vault since 1991, i.e. the first Gulf War, and that since then no one had reported its disappearance from Iraq Museum. It is anybody's guess if the motives behind hiding these most treasured ancient Sumerian artifacts were to make them safe, or to eventually appropriate them, similarly as it was recently done to huge monetary funds from the same bank. As many of you know, Zecharia Sitchin's dying wish was that the skeleton of Queen Shubad/Lady Pubai would be tested by geneticists to determine if her mitochondrial DNA (mtDNA) could be recovered and compared to normal human mtDNA. Zecharia was convinced that Pubai descended directly from Anunnaki goddesses, and if that were true then her mtDNA would be of only those and not of humans. On my recent trip to England, I went to the Natural History Museum in London to meet with Dr. Margaret Clegg, the museum official in charge of overseeing all human remains. She was mentioned in Zecharia's last book, "There Were Giants Upon The Earth," as the person he had been dealing with, so I undertook to determine what the Museum would require to allow for invasive and destructive DNA testing of a small portion of Puabi's bones. Dr. Clegg agreeably provided me with a list of the Museum's protocols, which are strict and thorough, but all of which can be met with sufficient rigor on the part of the Sitchin family trust that is charged with trying to carry out his last wish. Now the trust is moving forward to meet those protocols, and I would urge everyone reading this to refrain from pestering Dr. Clegg about the matter. At present she can do no more than she has done, nor can I. Now it's up to others to carry the process forward from this point. Nymphs and daughters of the Cretan king, who cared for Zeus in a cave when he was a baby. boasted the first ziggurat, or temple tower, and began the use of clay cylinder seals. Addad, Haddad, Rimmon, Rammon, Adonis, Baal in the Bible). was once believed to be Birs Nimrud in Borsippa or modern Es-sahen. fight against Tiamat but did no fighting himself. was also patron of all arts, and the chief god of the Mesopotamian city of Eridu. EA=Earth. Oannes was under the name Dagon. Anu’s wife was Antu, and their children were the Annunaki. men who in their lives had been unjust judges. themselves, and which became the modern idiom, "Iran." maketh Arcturus, Orion, and Pleiades, and the chambers of the south). adapted from the Arabic for "the camels slaking their thirst." The name originally applied to the stars. was Dungi, the son of the goddess Ninsun. The caduceus is one of the most ancient of symbols. You might best know this symbol as the DNA structure and healing used by the medical profession. Since ancient Mesopotamia the caduceus presented two serpents intertwined (the central nervous system) around a staff (the spinal column) with the wings (the "swan") on either side (the two hemispheres of the brain, with the circle in the center representing the pineal gland, or the central sun and psychic center within). It also symbolized the kundalini energy. The serpent always represents spiritual wisdom, life and healing. The first symbols of serpents were attributed to Enki and then Ninhursag. However, the story of the serpent becoming an evil symbol began with the wars between Enki and his brother, Enlil (later known by the name "Allah"). These conflicts began at birth and had to do with birthright to the royal throne of the Nibiruan civilization in which their father, Anu, was the leader and father to Enki and Enlil. There was a time when Anu felt Enki (due to his wisdom and magical abilities) was the only savior of the Anunnaki people (" Enuma Elish"). The clay tablets tell us of the Elohim/Anunnaki who were extraterrestrial beings that came to our planet from the star "Sirius". They genetically manipulated indigenous beings (which they called beasts) creating the human race. In the tales were father-god, An/Anu, his two sons Enki/Ea and Enlil/Ilu-kur-gal, the primary male beings featured in the story of the creation of the Adama/Adam & Eve. Enki was very impressed with, and felt compasion towards, the products of this genetic work, namely "us", whereas Enlil was of the mind that the beings were only worthy of servitude. The ancient Sumerian gods, and their feuding acts, have been found in later religious myths with the same basic stories, however, the names Ea, Enki, Enlil, Anu etc, were changed to Ahura Mazda, Jehova, Lord, Ahriman, Baal, Adon, Etc. Biblical myths of Jacob and Esau, feuding over over birthright, are similar to accounts in the Sumerian tales of Enki and Enlil. The Anunnaki, as a whole, were compelled to allot for themselves the status of gods over the lowly humans. The archetypal feuding brothers can be stereotyped and categorized by their respective attributes, Enki is also called Adonai (the "Lord"), and his (divine) attributes are compassion, wisdom and fertility (sexuality), Enlil is called El Shaddai, The lofty Mountan (YHWH), and "Jehova", he was a storm-god (the bringer of vengeance and wrath) jealous and controlling. Therefore "The Lord" and "Jehova" are not one in the same, but two different beings. It was Enki and his sister Ninhursag who performed the genetic manipulation which resulted in the Adama (the ancient name for the first human, Adam and Eve). Humanity was conditioned to be in the service of the gods, but Enki had another plan, which set off a continual series of events, which most adversarial myths, concerning the war over the humans, between Enki and Enlil, were fashioned. Enki desired to feed the humans the fruit of the tree of Knowledge. This he knew was the thing which would open the eyes of man, and multi-dimensionalize his consciousness. This did not go over well with the Anunnaki, and Enki was commanded not to allow us this fruit. It was Enlil that attempted to scare the humans into not eating the fruit by telling them that, if they ate it, they would die. Enki went against the wishes of the high council and was able to convice them to eat the fruit anyway. When the gods saw what he had done, they condemned the act, and insisted that the corrupted humans be exiled from the land of paradise. Enki was man's preserver and compatriot, Enlil was the bringer of woes and doom. It was also Enki that saved humanity from the flood, which was brought on by Enlil. Enlil also destroyed Sodom and Gommorrah, which contrary to current precepts, were great citys of freedom and learning, not deserving of the jealous and controlling Enlil's destructive rage. Enlil is also purported to have destroyed Babylon, confounded the languages (after the tower of Babel incident), and wreaked havoc upon the city of Ur. It is extremely important to understand these original stories, as they were written in the Sumerian tablets, and compare them to the 4000 year lated adaptations in the Bible. Ea/Enki, was the good guy. It was him who fed man of the tree of knowledge. So why the need to flip this story completely upside down and condemn him as the evil one? In the Bible the word translated as "serpent" is "nahash" (NHSH) which literally means to decipher, or to find out. All throughout ancient times the serpent was known as the bringer of knowledge (hence, the euphemism "be ye wise as serpents") and were the precipitators of enlightenment. It is this precise thing that compels us to look further into the possibility that the good-guy is the one that is condemned throughout religious writings, for teaching freedom and knowledge. The freedoms of plant useage/taking for enlightenment, freedom of sexuality, and even the freedom to not be subservient to those oppressive gods who condemn these things as evil. In the cuneiform symbolism it is the caduseus (the snake coiled around the staff) which is the representation for Enki, in fact is is his personal emblem. After Enki fed the humans of the tree, and was then effectively exiled, those who remained under the control of Enlil and the Annunaki were then clamped-down-upon, in a heavier way. It was Enlil that was worshipped through fear and in later cultures named Jehova. Enlil, that old extraterrestrial who adamantly opposed the education, freedom, and enlightenment of humanity in every ancient Sumerian myth. A full set of laws would be adopted, the other humans were instructed not to associate with Enki/Ea or the exiled. So humanity received the first commandments. The name Enki means "Archetype", which is precisely what he was -- archetype of post-Sumerian gods. Turning to our anthropomorphising of the mushroom theme, we find more interesting connections. Even beyond the above discussed fruit-of-the-tree-story. Enki AND his sister Ninhursag were the creators of the Adama. The red of the mushroom cap, as well as the juice, are anthropomorphised as blood, and figuratively related to as fire. The cap is also considered the female genital organ, as was the cup (like the Holy Grail) from ancient times. While the mushroom stem is the phallus. Anthropomorphically the mushroom is androgenous, in one sense, being one entity yet having both male and female sexual organs visible. In another sense it is two separate beings, joined together, in the act of creation, albeit only the sexual organs are visible. Enki is the stem, Ninhursag the cap, the two joining in accord to produce the Adama, anthropomorphism of the mushroom into the two elementary archetypal creators. Further evidence is the substance fed to the faithful of Enlil and Ninhursag known as "Star-Fire". This supplemental nourisment was produced from the lunar essence, or blood (from the womb), of the goddess Ninhursag. It is also called "the gold of the gods" and even "the red gold". After the epic Anunnaki's abandonment of humanity, brought about by the fall of Babylon, when Enlil sabotaged the city, confounded the languages, and alloed the city to be laid waste. Some myths tell us; when the Anunnaki withdrew, "like birds taking flight", they took with them the 'Star-fire', or at least the knowledge of what the 'Star-fire" was. The priestly caste which remained, now under seige, needed again, to take the knowledge underground. Much as the later alchemists, the knowledge of putting the gold to-the-fire to create the alchemical gold, the secret of enlightenment, kept the process a secret.